Make it Easy by Jane Lovett is a feast of flavour and colour packed which is packed with tasty recipes to excite any food lover. This fantastic book has amazing recipes including Swedish Salmon, Tartiflette, Roast Belly of Pork, Sausage Apple and Onion Lattice Pie, Stem Ginger Ice Cream and Lemon Posset (heavenly!). This book has lots of hints and tips which do as the title suggests and make it easy for the budding home chef so that being in the kitchen is fun and a pleasure. Jane Lovertt shares her tips and rather than keep them as trade secrets. The recipes are easy to follow with clear instructions with details of what can be prepared in advance. Above all the book is bright, fresh and contemporary. Never before have so many people wanted to cook and experiment with food in their own homes. Worried by the credit crunch, horror stories of excessive salt, fat and sugar in ready meals, the rise in obesity and the questionable source of many foods, home cooks want to get cracking in their own kitchens. Make it Easy by Jane Lovett is a must have for any budding home chef! 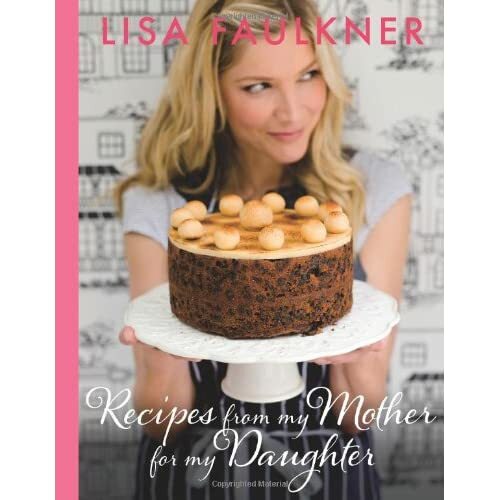 Actress and Celebrity Masterchef winner Lisa Faulkner provides a range of delicious meals for the whole family in this cookbook. Lisa Faulkner on Masterchef was a joy to watch, it took her quite some time to totally believe in herself even when she made it to the final. She was inspiring to anyone who has doubts about themselves, and is proof that if you believe in yourself then the sky is the limit. Lisa winning Masterchef was the culmination of an emotional journey that began with her mother's death from cancer when Lisa was 16. Lisa's clearest memories of her mum are of her cooking delicious meals for the family, and in recreating her recipes in this book Lisa is not just keeping her mother's memory alive - she is also able to pass on to her own daughter, Billie, the love of cookery she inherited from her mum. Among the tasty dishes included are the MasterChef Fish Stew, Lemon Mascarpone Tart and family favorites such as The Perfect Roast and Nanna's Bread. The recipe's are delicious and well laid out. The photography is stunning and Lisa's approach to cooking for her family and friends is delightful and comes through with the fantastic stories she tells with each recipe. Recipes from My Mother for My Daughter would be wonderful addition of any cookbook collection.